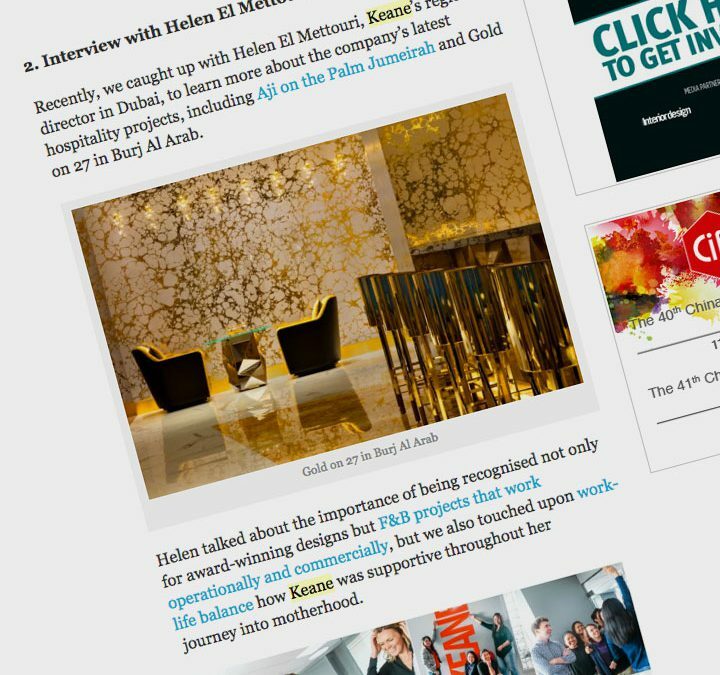 Speaking to Commercial Interior Design magazine, Helen El Mettouri, Keane’s regional director in Dubai, shares her thoughts on F&B design as well as the company’s latest hospitality projects. “We have too much of everyone else’s ideas and concepts in the region, and we genuinely want to start creating concepts here that belong here, start here, and represent here. Every great F&B market globally has the range, and that is what we lack,” she says. Keane’s latest hospitality projects include Aji on the Palm Jumeirah and Gold on 27 in Burj Al Arab. “We recently completed Besh Turkish Kitchen in Sheraton Mall of Emirates, Gold on 27 in Burj Al Arab, Aji at Club Vista Mare on the Palm, Pret a Manger, Hudson’s Coffee and Wolfgang Puck at the Changi International Airport in Singapore. “We are currently working on a great mix of projects including several F&B outlets in the W Dubai – The Palm, Tiger Beer Bar in Changi International Airport and creating the design platform for the world’s first Jelly Belly ice cream stores,” she adds. The best way to understand F&B design, as El Mettouri puts it, is to have worked in the industry. She feels though that the hospitality market here is saturated and although the interior design plays a part in the success of an outlet, design alone is not enough. Read the full interview in the August issue of Commercial Interior Design magazine.